The ART dPDB Passive Direct Box features two high-quality direct boxes in one portable enclosure. It is a rock solid, roadworthy DI for connection of the outputs of electronic musical instruments (or other audio sources) to the balanced inputs of mixer consoles and other balanced inputs. It also allows connection of a music source to an instrument amplifier while simultaneously patching it to a mixer. Applications for the dPDB include DI sends for electric guitar and basses, keyboards and line level signals, microphones, DJ console output signals, speaker level signals and more. 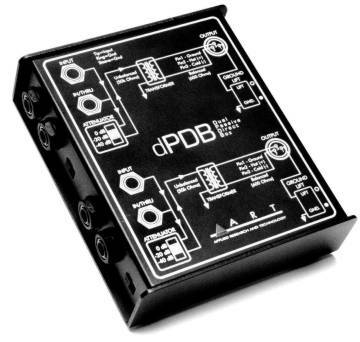 The dPDB excels at impedance matching and improving the sound of any instrument plugged into it.